Download and print an information sheet about the campaign here. 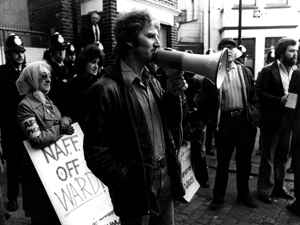 We seek to overturn the unjust prosecution of 24 building workers following the first ever national building workers strike in 1972. 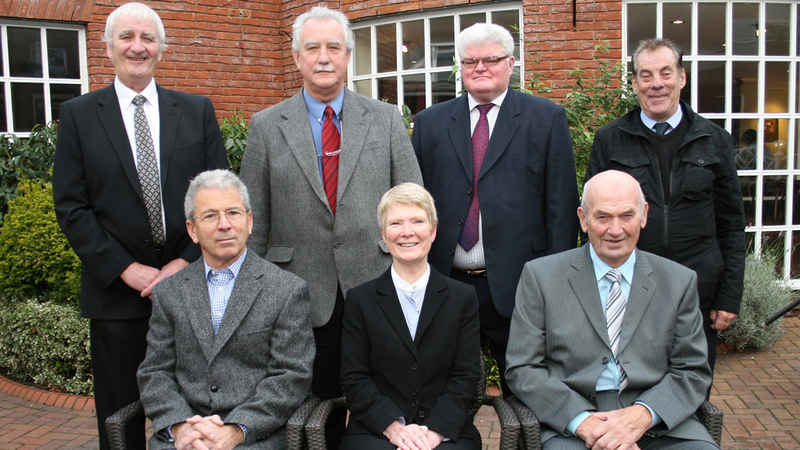 They picketed building sites in Shrewsbury and were prosecuted in 1973. 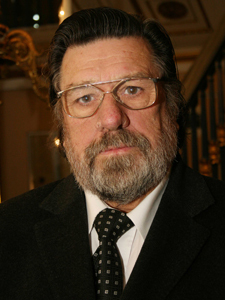 They became known as the “Shrewsbury 24”. 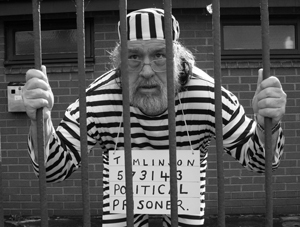 The Petition demanding that the Government release documents relating to the conviction of the Shrewsbury 24 was served at Number 10 Downing Street on 16th December 2013. Find out more here and here. 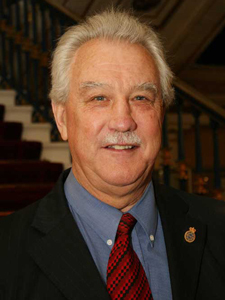 The Parliamentary Debate on 23rd January 2014 was won by 120 to 3 – find out more. The Shrewsbury 24 Campaign extends it support to the OTJC in their call for an Orgreave Independent Panel to be set up along the lines of the landmark Hillsborough Independent Panel. 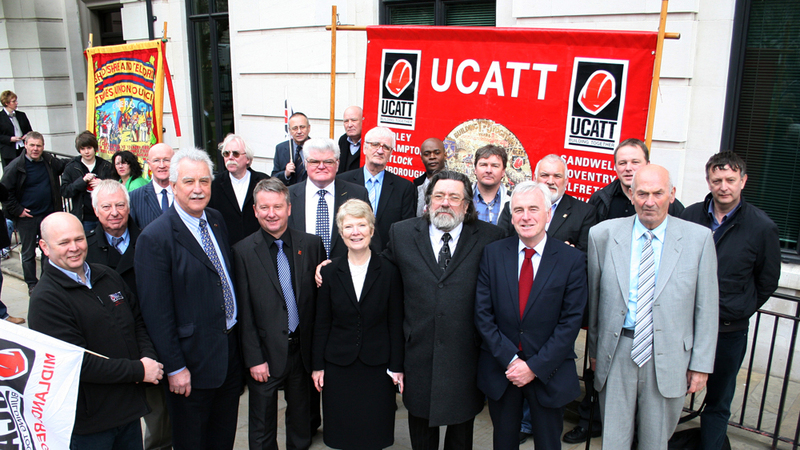 These principled campaigners have worked tirelessly for years to uncover the truth about the events at the picket at Orgreave on 18 June 1984. 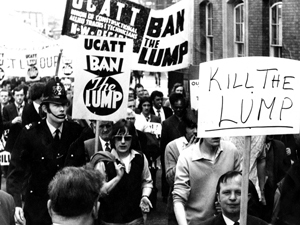 On that day hundreds of miners were attacked and beaten by an army of police, including a mounted unit that charged down with batons on unarmed striking miners causing devastating injuries. 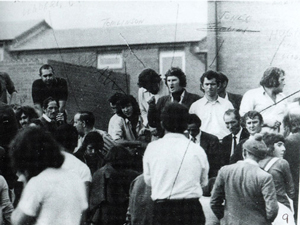 The trial of the 95 miners that were arrested on that day collapsed when the union lawyers showed that the police evidence had been fabricated. The campaign wants to know the truth: who planned and gave the orders for the police attack on defenceless miners, who orchestrated the prosecutions. Without Truth there can be no Justice. Further details can be found on the OTJC website. 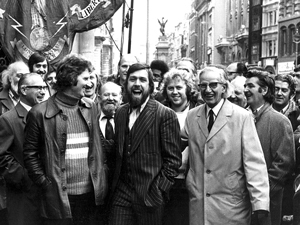 On Friday 9th November 2018 the Shrewsbury pickets won an important victory in their long struggle to overturn their convictions. 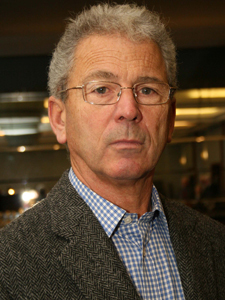 In the Administrative Court in Birmingham, Mr Justice Jay gave permission for the pickets’ application for judicial review to proceed to a full hearing. Read more about this landmark decision. Read the Morning Star article about the victory. The Shrewsbury 24 Campaign made an application to the Criminal Cases Review Commission (CCRC) on behalf of the pickets on 3 April 2012. After sending several additional lengthy submissions to the CCRC over the past 5 years we have now received their Final Statement of Reasons. We were extremely disappointed to be informed by the CCRC that they had decided not to refer the pickets’ cases to the Court of Appeal. 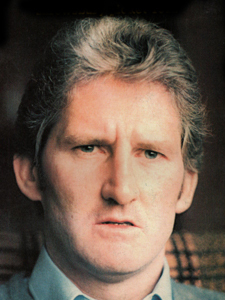 December 2017 – Ken O’Shea R.I.P. Campaign’s researcher, Eileen Turnbull, describes below how she tracked down the television programme, Red Under the Bed. 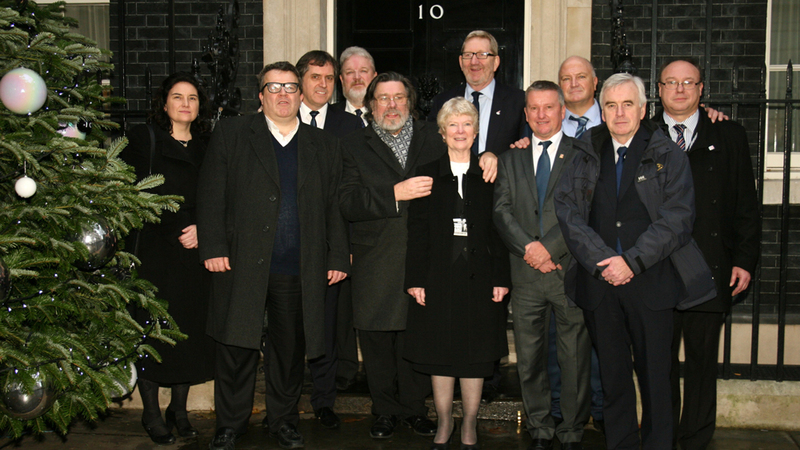 The Shrewsbury 24 Campaign, MPs and Union Leaders outside Number 10. December 2013. 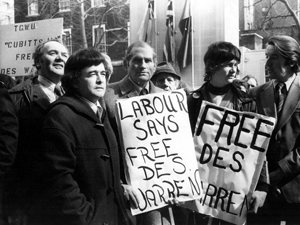 Left to right: Katy Clark MP, Tom Watson MP, Steve Rotheram MP, David Anderson MP, Ricky Tomlinson Convicted Picket, Eileen Turnbull Shrewsbury 24 Campaign, Len McCluskey Gen. Sec. 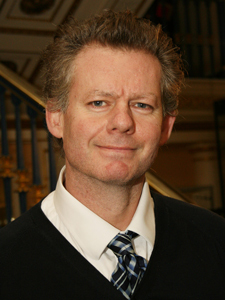 Unite, Steve Murphy Gen. Sec. 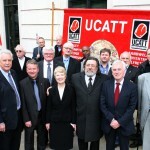 UCATT, Bob Crow Gen. Sec. RMT, John McDonell MP, Graham Morris MP. 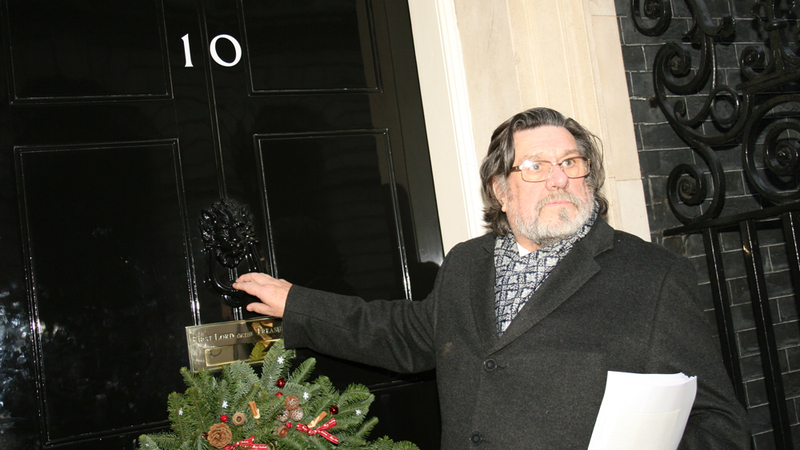 Serving the petition at 10 Downing Street, Monday 16th December 2013. 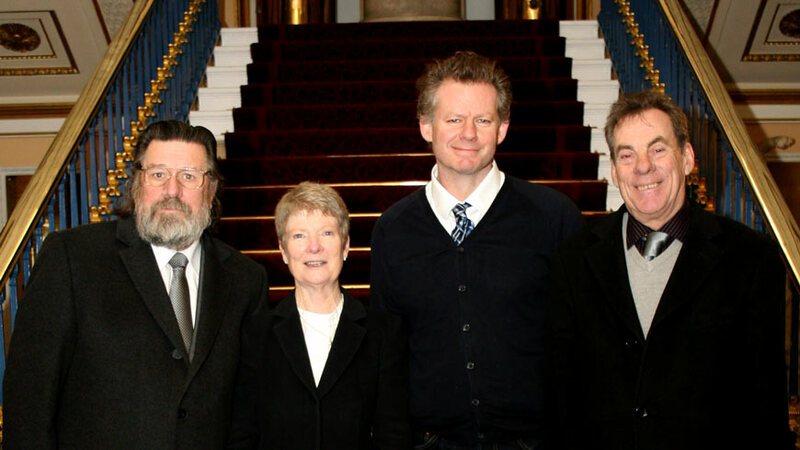 (L-R) Ricky Tomlinson (picket), Eileen Turnbull (Researcher), Andy Warren (Des Warren's son) and Harry Chadwick (Chair). 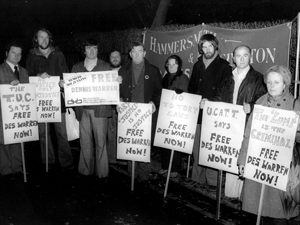 Back row (L-R) John Bohanna, Terry Renshaw, Kevin O’Hagan and Harry Chadwick. 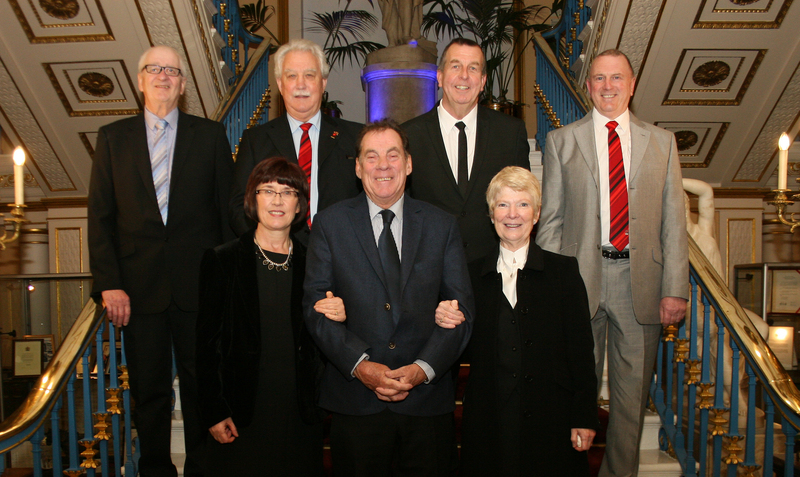 Front Row (L-R): John McKinsie Jones, Eileen Turnbull and Kevin Butcher. 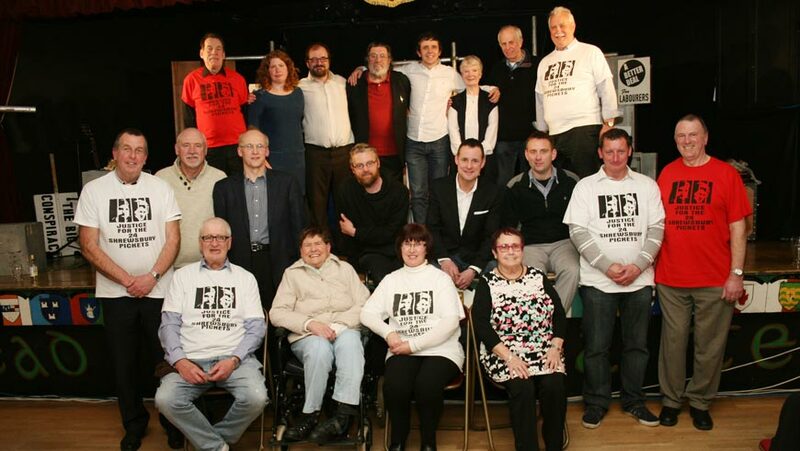 Townsend Productions with the Shrewsbury 24 Campaign after a performance of their play "United We Stand" at St Michael's Irish Centre, Liverpool, 1st April 2015. Back row (L-t-R): John Bohanna, Terry Renshaw, Phil Simpson, Ken Barnes. Front row (L-t-R): Ann Dobie, Harry Chadwick, Eileen Turnbull.